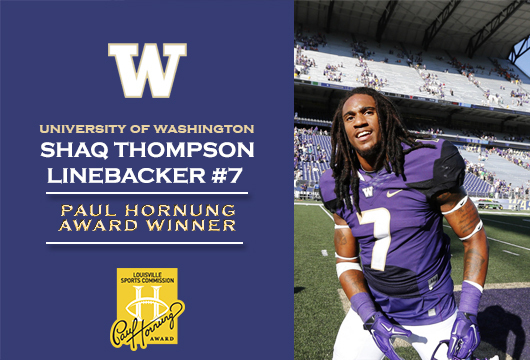 Louisville, KY – Friday, December 12, 2014 – University of Washington’s Shaq Thompson, a gifted athlete who has played linebacker, running back, safety and special teams this season, was named winner of the fifth annual Paul Hornung Award, presented by Texas Roadhouse. The Louisville Sports Commission and Paul Hornung present the Award to the most versatile player in major college football. 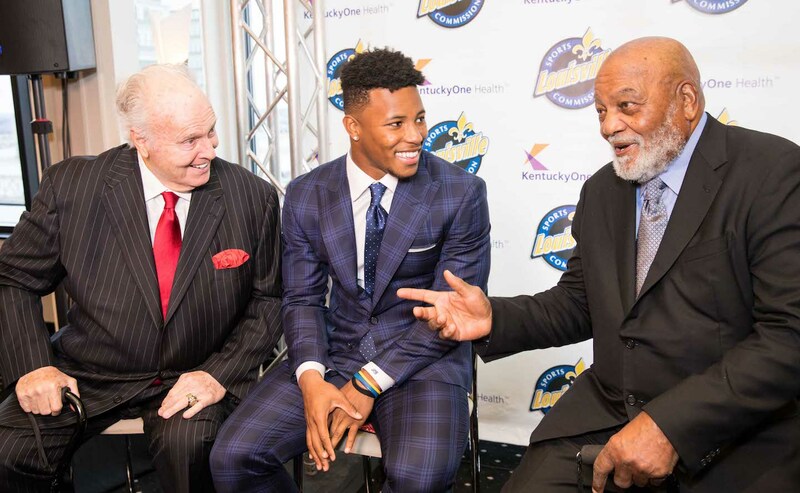 Thompson and his family will be honored on Jan. 27, 2015, at the annual Paul Hornung Award Banquet presented by KentuckyOne Health at the Galt House Hotel in downtown Louisville. A junior from Sacramento, Thompson was named first-team All-Pac-12 at linebacker and first team All-Pac-12 as the all-purpose/special teams player by the league’s coaches. He played in six games on offense, finishing the regular season as the second-leading rusher for the Huskies with 456 yards while also recording 56 yards receiving. One of college football’s most prolific two-way players, Thompson shared the national lead for fumble recoveries with four and scored six touchdowns – two on offense and four on defense. For the season, he compiled 13 plays of 10 yards or more, four on defense and nine on offense. Of his 57 rushing attempts, 10 have gone for 10 yards or more. He averaged 42.5 all-purpose yards per game (rushing, receiving, interception and fumble return); nearly eight yards per carry; 14 yards per reception; and was fourth in total tackles, tied for the team lead in fumble recoveries and led the team in defensive return yards. On defense, Thompson had 71 tackles, one interception return of 36 yards for a touchdown, forced four fumbles and recovered three fumbles with 184 returns yards and three touchdowns. Against California with the game tied at zero, he raced 100 yards on a fumble return to give the Huskies a lead they would not relinquish. Thompson played in six games on offense, recorded 512 total offensive yards, led the Huskies’ rushing three games and twice hit the century mark – 16 carries for 174 yards versus Colorado and 15 carries for 100 yards versus UCLA. Thompson’s versatility was on full display in several other games. In a win over Illinois, he had a 36-yard interception return touchdown, a 52-yard fumble return touchdown, four tackles and carried the ball three times for 16 yards. He became the first Husky to score two defensive touchdowns in the same game. On Sept. 27 versus Stanford, he recorded his fourth touchdown of the season by stripping the Cardinal running back of the ball, picking it up and rumbling 32 yards for the touchdown. Thompson also forced a second half fumble, finished with seven tackles, one pass break-up and three carries on offense. A stalwart at linebacker for the Huskies, Thompson also played safety in that game where he, “tackled like a linebacker and covered like a defensive back,” according to Coach Petersen. Washington finished the regular season 8-5 and 4-5 in the Pac-12, third in the Pac-12 North and is headed to the TicketCity Cactus Bowl to play Oklahoma State on Jan. 2 at 10:15 p.m. EST on ESPN. Thompson was chosen as the Paul Hornung Award winner from among five finalists by a 16-member national Selection Committee comprised of sports journalists and retired NFL players and secured an additional first place vote from online fan voting. All votes were independently tabulated by regional accounting firm Dean Dorton, one of the largest accounting and advisory firms in Kentucky, with offices in Louisville and Lexington. Other 2014 Paul Hornung Award finalists were: Ameer Abdullah (Nebraska), B.J. Catalon (TCU), Ty Montgomery (Stanford) and Marcus Murphy (Missouri). Owen Marecic of Stanford, a two-way starter and All Pac-10 performer at fullback and linebacker, won the inaugural Paul Hornung Award in 2010; Brandon Boykin of Georgia won the award in 2011 after excelling on defense, offense and special teams; Tavon Austin of West Virginia won the award in 2012 as one of two players in the nation with more than 500 yards in three different categories (rushing, receiving and kick returns); and Odell Beckham Jr. of LSU won the award in 2013 after finishing the season ranked second in the nation and first in the Southeastern Conference with 2,222 all-purpose yards and 185.2 average yards per game. Past winners and finalists have made their mark in the NFL, including Boykin (Philadelphia Eagles), Austin (St. Louis Rams), Beckham Jr. (New York Giants), Western Kentucky’s Antonio Andrews (Tennessee Titans), Texas A&M’s Johnny Manziel (Cleveland Browns), Arizona State’s Marion Grice (Arizona Cardinals), Kentucky’s Randall Cobb (Green Bay Packers), Oregon’s LaMichael James (Miami Dolphins) and TCU’s Jeremy Kerley (New York Jets).